With Valentine’s day around the corner, you may be racking your brain for gifts and things to do in the Arena District or downtown Columbus. Share a heart-shaped lasagna or spicy chicken rigatoni with your sweetheart at Buca di Beppo. Click here to reserve your table, available February 12-14! 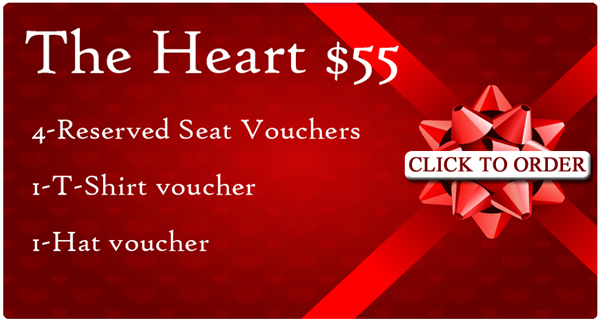 Columbus Clippers offer a variety of Valentine’s Day offers available January 30-February 14. Guarantee delivery by Valentine’s Day by ordering before February 7, or you can pick-up in person. Packages range from $32-$65. Click here to order online or call the Tickets Line at 614-462-2757! Max and Erma’s offers love at first bite! Dinner for two includes: one shareable, two entrees, and one dessert for only $29. has you covered for a fun filled evening that will have you Singing, Laughing & Dancing this Valentines Weekend. Give a pizza your heart while giving back! $0.50 to from the sale of each pizza January 23 – February 14. They are also collecting guest donations through the purchase of Paper Hearts in-restaurant. Don’t forget Heart-Shaped Pizzas are available February 10-14! What could be more sweet than an ice skate date! Columbus residents represent BEST city in the WORLD! Columbus is not only known by its’ residents of downtown swanky apartments, but is being recognized by outsiders as the best city in the WORLD! Within areas like the Arena District and Grandview Yard, residents are getting luxury style apartments at a fraction of the cost you would pay in larger cities like New York. But unlike those larger cities, Columbus has yet to hit its peak, and its apartment residents are living in the heart of the excitement. In addition to the walk-able amenities resident communities offer, Columbus is known for the best library in the country, the best zoo in the country, the best science center in America and America’s largest universities. Let’s not forget, we’re pretty cool too! Why All the Cool Kids Love Columbus, Ohio.